This is the key to the oriental Kabbal. This one has been created by Joseph Balsamo, earl of Cagliostro, born on the 8th of June 1743 in Palermo, and who did, throughout his numerous journeys around the world, gather knowledge in the domain of the occult and secret sciences which gave him the utmost reputation by his contemporaneous. The discovery of a very ancient oriental manuscript made him lift the veil of the mysteries of the hand of Fatima. 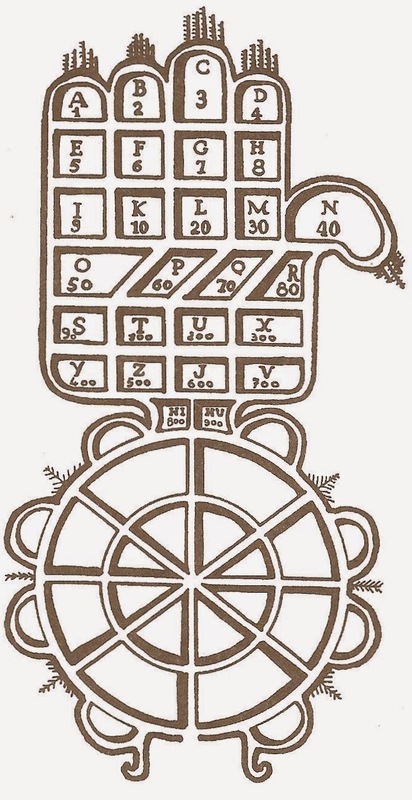 For you to be able to unveil your winning numbers, you should take the letters of all your names and note the corresponding numbers in this hand of Fatima. Then add together the different numbers and you obtain your magic number. Example: Patrick Lemaire: Patrick= 263, Lemaire= 150, the two added together equals 413, so the magic numbers of Patrick are: 4, 1 and 3.